A Pathfinder compatible adventure for 10th-12th level characters. Roughly three centuries ago the young Zakelana began her adventuring career as a wizard. She took to the profession naturally and met with great success throughout her career. In addition to her talent for magic, she also had two other gifts. The first was an amazing knack for getting into (and then out of) trouble. The second was a gift for one was for turning enemies into allies. Zakelana took a rather aggressive approach to adventuring and had a rather broad definition of what counted as a legitimate target for adventuring operations. While most adventurers confined themselves to dank dungeons, Zakelana often adventured within the towers rival mages and the palaces of royalty. As might be imagined, this approach earned her the anger of many powerful people who had the ability to send powerful assassins and monsters to exact their vengeance. 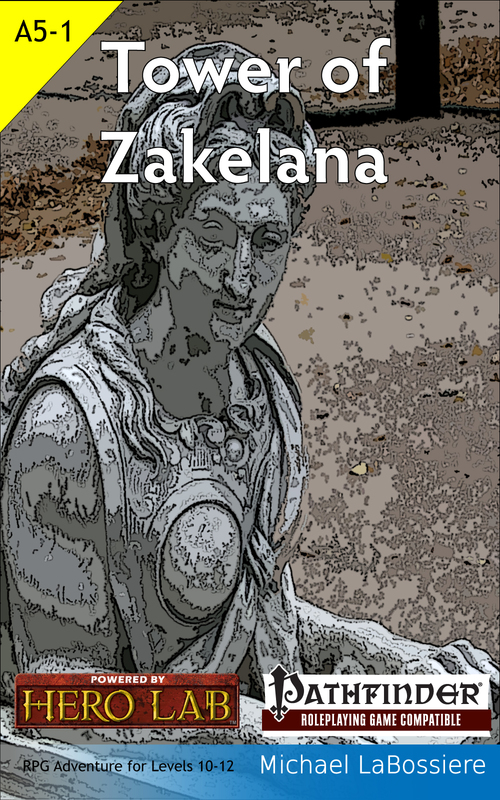 Whenever possible, Zakelana attempted to persuade any would be killer that survived her defenses to switch sides. Most of the time, the assassins showed commendable loyalty before being killed by Zakelana. However, she was able to win over many of the monsters. The best known example occurred when a rival mage send a creature to torment Zakelana in her dreams. According to the tale, Zakelana was able to win over the creature with the gift of a pony and the creature came to work for her. In her later years, the incredibly powerful Zakelana retired from adventuring and worked on researching new magic. She is said to have excelled in mastering extra-dimensional spaces. It is said that she was able to move and entire tower into an extra-dimensional space. It is also said that one day she simply vanished. Some speculate that a final experiment failed and banished her to some other dimension eternally. Another tale relates how one of her many enemies finally caught up to her and defeated her. Other tales say that she grew tired of this world and moved on willingly to another. In any case, she vanished but left behind a tower-or at least a way to reach her tower. That is, Zakelana created a magical gateway to the space containing the tower. In addition to its most amazing ability, the gateway also possesses the power to shrink down to the size of a child’s toy. Wherever Zakelana went, she left the gateway behind anyone who possesses it can enter the dimension of the tower, provided that they are brave (or foolish enough). What are you doing reading this on the Fourth of July? You should be out searing some meat, drinking beer and blowing stuff up. Get off the web and get back to being a real American! Unless you are looking up how to treat burn injuries. If so, check out the Mayo Clinic on this subject.